A mysterious video posted on YouTube claims there is a supermassive wall located beneath Earth’s oceans, encompassing the entire planet. This mysterious wall, found by a YouTube channel called ‘Flat Earth Arabic’ claims the massive wall tens of thousands of miles across beneath the ocean. In the distant past, UFO enthusiasts and conspiracy theorists have found countless unexplained things on Google Earth. From pyramids to mysterious towers, petroglyphs, and even sunken cities, Google Earth has unleashed the imagination of people around the globe. Not long ago we reported about a supposed discovered just off the coast of Mexico—12°8’1.5″N, 119°35’26.4″W—where a researcher discovered a humongous underwater pyramid. Among the many structures that are said to remain hidden beneath the ocean, ‘researchers’ have found things that—supposedly—challenge everything we know about our history. Last year, a teenager using Google Earth ‘discovered’ what researchers are calling one of the largest, previously unknown ancient cities belonging to the Maya. In similar ways, researchers all around the globe have been hunting for Pyramids and lost structures that have eluded experts for decades. In 2012, American researcher Angela Micol discovered ‘Pyramids larger than those found on the Giza Plateau, using satellite images. But countless different discoveries have been made using Google Earth. Last year we reported about a complex of structures that stretch for a staggering 76 miles at its furthest points. The formations found off the coast of Baja California include mysterious tube-like constructions that are roughly 2.4 miles in width. 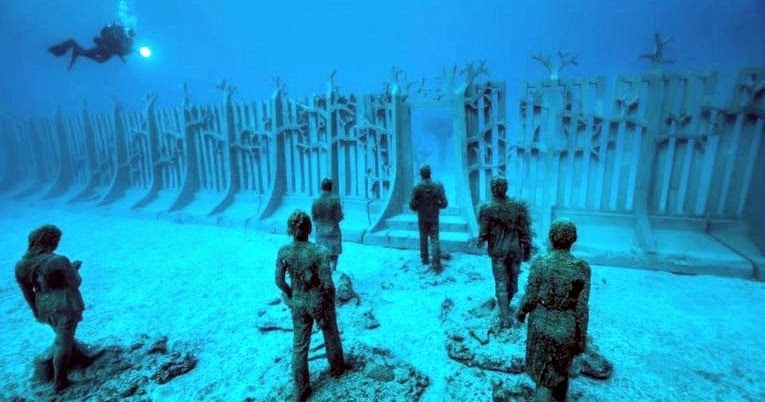 Given the curious shape and distinguishable lines, many believe these are just some of the many underwater structures on our planet. However, these new claims go beyond anything we’ve probably ever come across. This wall’s sheer size and its adherence to linearity indicate it is not a natural formation to many. In fact, many people are convinced that due to the numerous discoveries made across the globe which completely contradict history as we have been taught in school, something like this is entirely possible. After all—they say—Earth is millions of years old and we are begging to uncover evidence that suggests many ancient civilizations inhabited Earth in our planet’s long history. BUT, HOLD ON A SEC, THIS CAN’T BE A WALL, RIGHT? Zooming in on the provided coordinates you clearly see what seems to be a MASSIVE structure. But who could have erected such a wall? If it really is an artificial structure, how old is it? What was its purpose? Many disagree and don’t believe we are looking at an actual wall. In fact, there even might be a perfectly reasonable explanation for the enigmatic finding. What if we are looking at a Google Earth glitch? Due to the fact that Google Earth uses different images while ‘mapping the planet’, it isn’t uncommon to encounter parts of the map that just didn’t quite match perfectly, resulting in a MASSIVE wall that encompasses the entire planet. One of the most likely explanations for this ‘impressive find’ is that we are looking at a digital seem in the mapping of the Poles. Image stitching or photo stitching is the process of combining multiple photographic images with overlapping fields of view to produce a segmented panorama or high-resolution image. Commonly performed through the use of computer software, most approaches to image stitching require nearly exact overlaps between images and identical exposures to produce seamless results. Image stitching is widely used in today’s world and was used in the satellite images we are seeing on Google Earth. BUT AN ENTIRE WALL THAT ENCOMPASSES EARTH? A lot of things can have played a role in creating such an effect. Illumination, point of view, reference, and many other things may have played a crucial role in this massive error. One of the most likely reasons for the seam appearing could be the background changing between two images for the same continuous foreground. What are we looking at there? A Supermassive wall as the above video claims? Or just another glitch in the image processing techniques in Google maps?